Odd as it may seem, the past few New Year’s Eves have seen the birth of an Atlanta tradition for me. However, the tradition is not what you’d expect. There are no tuxedos and champagne flutes, no cover charges and crowded bars, not even a small tv showing the huddled masses in Times Square. No, the end of the past few years have featured almost obscene amounts of Chinese food. Last year, it was a gut busting outing at Peter Chang’s Tasty China 2 complete with several bags of take-out to savor in Jackson. 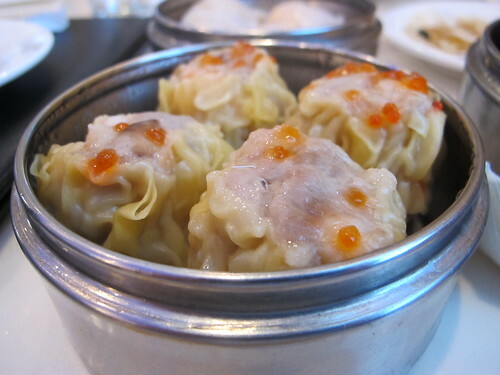 This year, Jennifer and I decided that, since it was Saturday, dim sum was in order. Although we’ve both come to rely on Oriental Pearl for our dim sum needs, Jennifer proposed making the trek to Duluth to try Golden House, the new home of Chef Danny Ting of Wan Lai and Bo Bo Garden fame. A short drive and a somewhat long wait later, we were shown to our two top where the wait for the steamer carts began. An order of pepper shrimp was first off the carts. Even though these pepper shrimp had been on the cart for too long and were cool to the touch, they packed a healthy dose of well seared shrimp. The peppers may have lost a bit of their snap, but the potent salinity of the black bean sauce and briny shrimp paste more than made up for it. 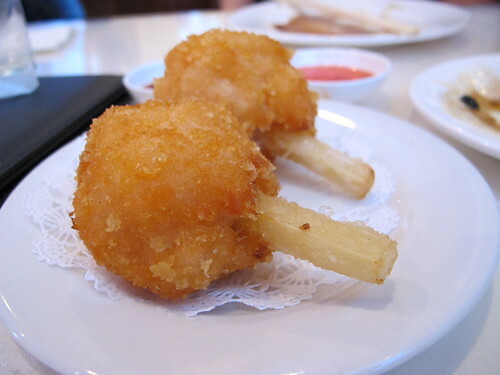 Sticking with shrimp, shrimp on sugar cane was next. As you’d expect this was a ball of lightly breaded, slightly sweet, and well fried shrimp paste. Although the crispy exterior and savory flavor of the shrimp were exceptional, I was pleasantly surprised at the complete lack of greasiness. 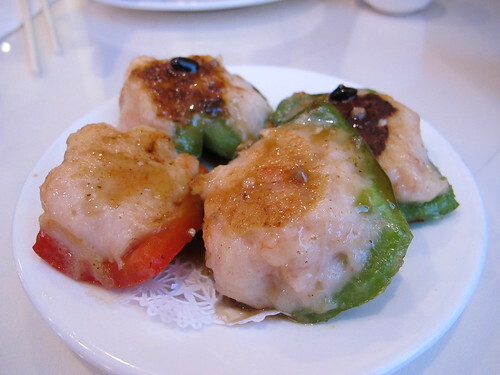 Continuing with even more shrimp, the ultimate dim sum litmus test arrived, har gao. It’s not often that I encounter such a sublime dumpling. 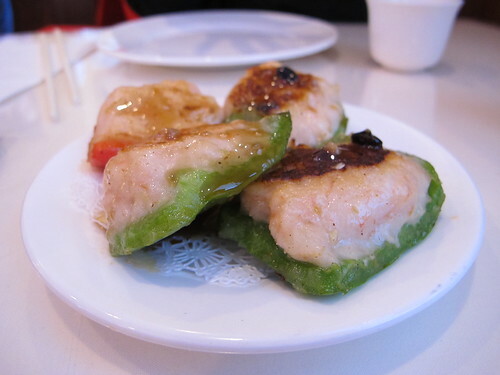 From the slightly thick wrapper to the rich, juicy shrimp filling, these har gao passed the test with flying colors. 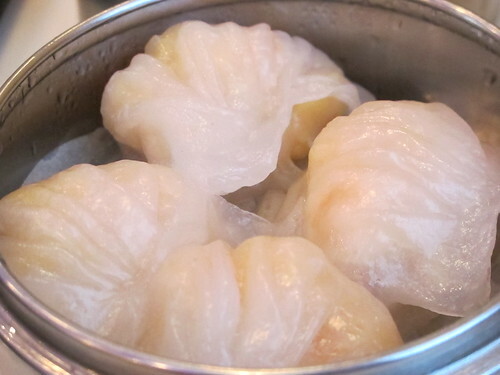 Each dumpling was packed with large chunks of impossibly fresh shrimp that finished with a slight peppery tail. An order of pork suimai provided a nice break from the shrimp overload. I don’t know how they do it at Golden House; these pork suimai had a tender wrapper and a juicy filling brimming with pork flavor but there wasn’t any of the expected greasiness. 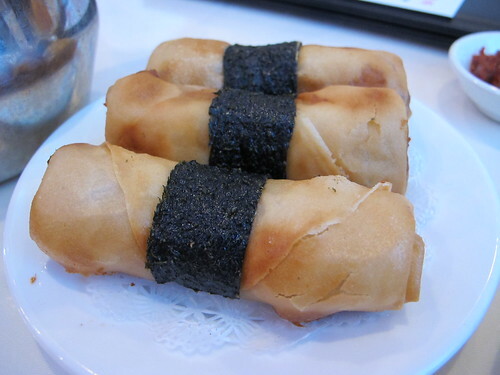 Eggrolls are usual dim sum item, but I don’t ever recall seeing them wrapped in nori. These chicken eggrolls were a little doughy on the inside, but a healthy dose of chicken filling seemed to even things out. 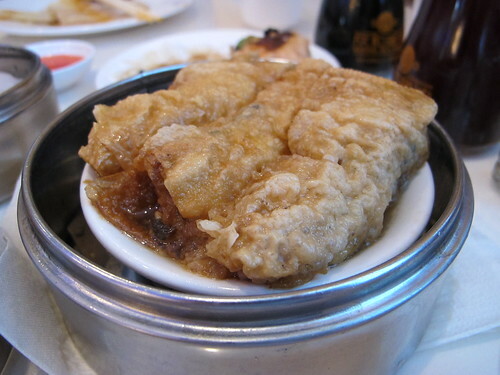 Seen Juk Guen or bean curd rolls, one of my favorite dim sum dishes, was bound to make an appearance sooner or later. 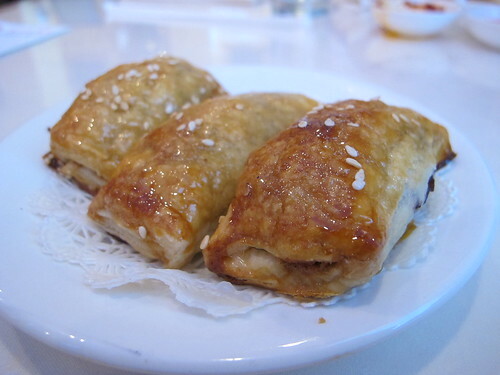 Light on the gelatinous sauce and light on the crunchy filling, these bean curd rolls still packed a pleasant pork and veggie filling. Simply because they are so filling, I rarely order char sui bao or sticky buns at dim sum but I couldn’t resist trying at least one at Golden House. As you’d expect, these buns were thick, doughy, and a little sticky on the outside. Inside was a thick, sweet filling with a surprisingly large amount of pork and just a touch of crunchy veggies. Like many of their other dishes, Golden House was generous with their char sui bao filling and it made for a quality sticky bun. 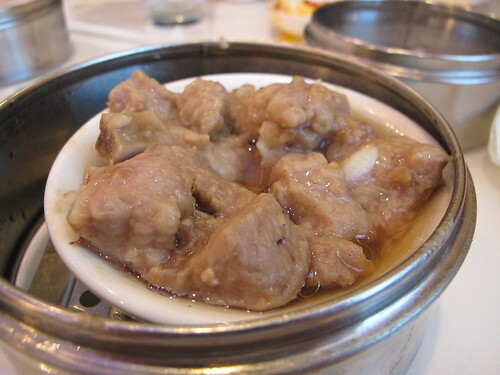 If there was one letdown to the meal, it came in the form of steamed pork spare ribs. On the plus side, these were exceptionally meaty and very well steamed spare ribs, but there was nothing else there. Instead of the usual black beans or pepper slices, there was just well cooked pork. I’m not sure why we ordered the sesame pork. 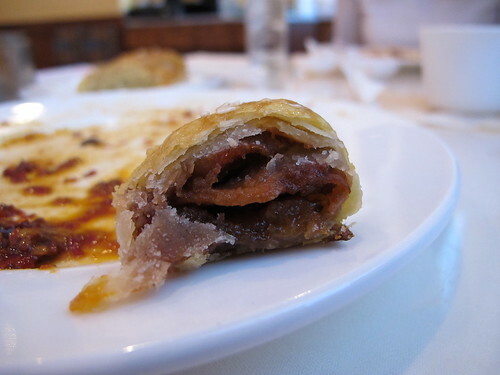 These pork pastries seemed to be a different approach to a sticky bun. Extremely sweet and doughy, the sesame pork came with the usual char sui filling. 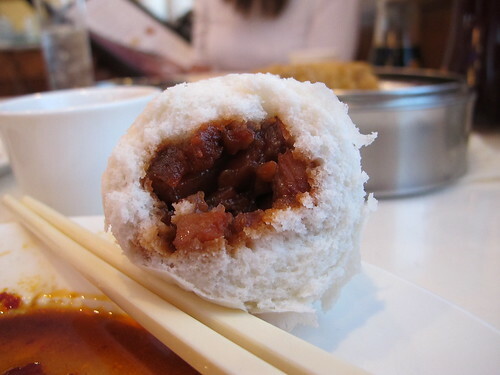 A decent dish, but the steamed sticky buns were the better choice. While waiting for an order of Jackson bound takeout, I decided to try one last dim sum dish, the shrimp and seaweed dumpling. As I had quickly come to expect, the shrimp was juicy and very well fried, but the nori wrapper kept throwing for a loop. 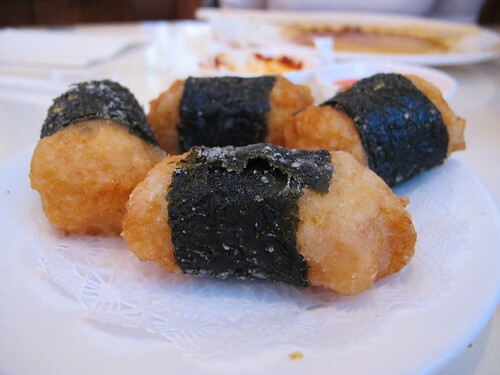 With each bite of the shrimp, I had dim sum dumplings and chili sauce in mind but as soon as I tasted the nori, I halfway expected to taste lukewarm sushi rice and the punch of wasabi. While I can hardly comment on the menu selections of Golden House, I can say that they are in serious contention for my favorite dim sum spot in Atlanta. Obviously many more visits are required before I can produce such a weighty verdict, but in the meantime I can take comfort in knowing that the Blissful Glutton did not steer me wrong. 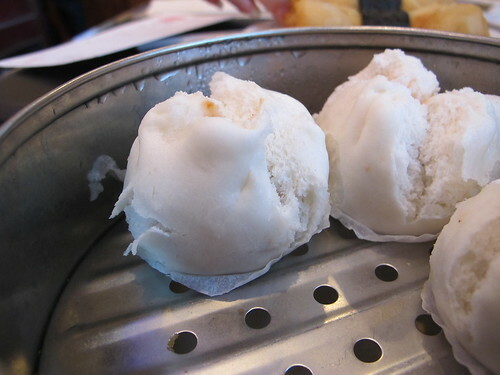 Chef Danny Ting and Golden House truly do serve the best har gao in Atlanta. Those dumplings alone are worth the drive to Duluth. I can hardly wait to stand in line for them again.